Preheat oven to 190 º C with oven shelf on centre position. Measure ingredients into the two bowls as listed above. Lightly beat Bowl 2 ingredients together and pour onto Bowl 1 ingredients, mixing with a wooden spoon until just combined. 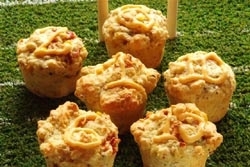 Spoon the mixture evenly into lightly greased SPAR GOOD LIVING 6-Cup silicone muffin pans, and bake for 20 minutes.